Our accommodation on this trip has ranged from the luxurious to the comfortable to the "I'm glad we're only here for one night", but nowhere has the difference been greater than in Rajasthan on the 24 and 25 November. On the night of the 24th, after stuffing ourselves with delicious Rajasthani food and enjoying fine Rajasthani music and dancing, we were loaded into a jeep and driven into the desert sand dunes where we were given a mattress, pillow and blanket each, and left to enjoy the starry night and (relative) peace of the desert. I say relative peace because there were three young Delhi lasses who were also sleeping out under the stars, and while they slept some distance from us, the foghorn-voiced driver sat with them for ages telling ghost stories or something like that. Whatever he was saying, it worked, because at 2am they decided to return to the comfort and safety of our guest house. Pussies. 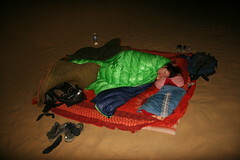 We had a v toasty night under the stars thanks to Phil's super-dooper double sleeping bag. The next night we had booked in at a place called Camel Camp - a luxurious resort featuring decadent tented accommodation and a swimming pool perched high on a dune above the town of Osiyan. 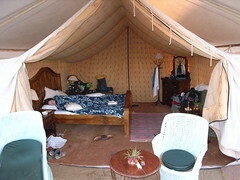 The tents exemplified camping in style - carpet, wooden double bed, marbled bathroom with hot water, sofa and lounge chairs out the front. The place was lovely but unfortunately the pool was freezing cold and as the only guests in this enormous resort, we felt a little isolated! Plus the nearby Jain temple was doing an all-night worship so the megaphoned singing and clashing drums went on all night. Thank god for earplugs.